Colin and Cameron have a terrible habit of leaving their toy cars in our kitchen. Inevitably, the cars end up lying with their most pointy parts UP; I end up not seeing them lying there because I am buzzing around doing whatever task I happen to be doing at the moment; then I end up stepping on them, nearly gouging my foot wide open which really hurts. 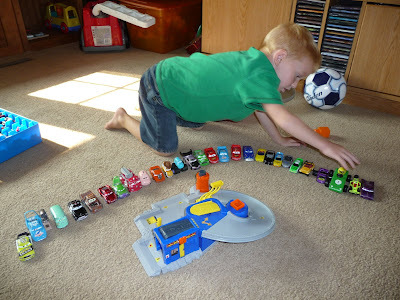 It is, without fail, one of my biggest pet peeves....therefore, I am fairly strict about the boys bringing cars into the kitchen/dining room area. "No cars in the kitchen, please." You can hear me saying this several times each day. 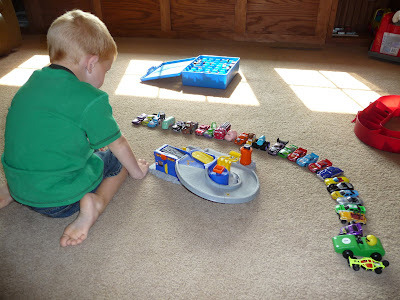 However--I have three boys, all of whom love to play with cars, and our living room (where they play most of the time) is right next to our kitchen and dining room. Cars, as I hard as I try to keep them out, sometimes slip in to "my" area. I was in the kitchen making spaghetti sauce from the *billions* of tomatoes in my garden. "There are three cars here in the kitchen--can you come and get them for me and take them out to the living room?" "Oh, this is great! We're all having an important meeting in the living room, and these guys need to be there too. Thanks Mom!" Ah....yes, yes. A very important meeting indeed. Oh man, cars are also a danger in our home and we have ALL wood flooring so I have slipped on more than I care to mention. I would love your sauce recipe...I am drowning in tomatoes!